Knowing when to start the orthodontic treatment in preparation for orthognathic surgery can also be tricky if our team at Steven J. Boral, DDS is treating a teenager. It is important to know when to get started. If orthodontic treatment is initiated too soon and the teenager is still growing, the patient will either need to hold in braces until his or her growth is complete and they are ready for surgery or the braces will have to be removed and then placed again when growth is complete. Neither of these options is attractive since it requires longer time in treatment, which is something all our patients want to avoid. 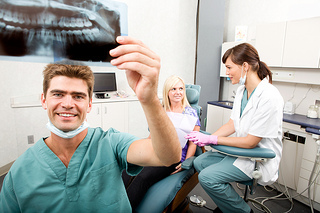 Our team at Steven J. Boral, DDS strives to get all patients finished with treatment as quickly as possible because it is healthier for the teeth and gums and gives them a beautiful smile to enjoy for a lifetime. If you are considering orthognathic surgery or you have been told that you need jaw surgery, give us a call to schedule your initial consultation today. Dr. Steven Boral and our team at Steven J. Boral, DDS will explain our treatment plan in a way you will understand and we will keep you informed every step of the way. « What’s the advantage to Invisalign®?